I recently had the opportunity to participate in a speaking engagement at Mobile World Congress America’s Women4Tech track. The topic? Increasing access to VC funding for women founders. 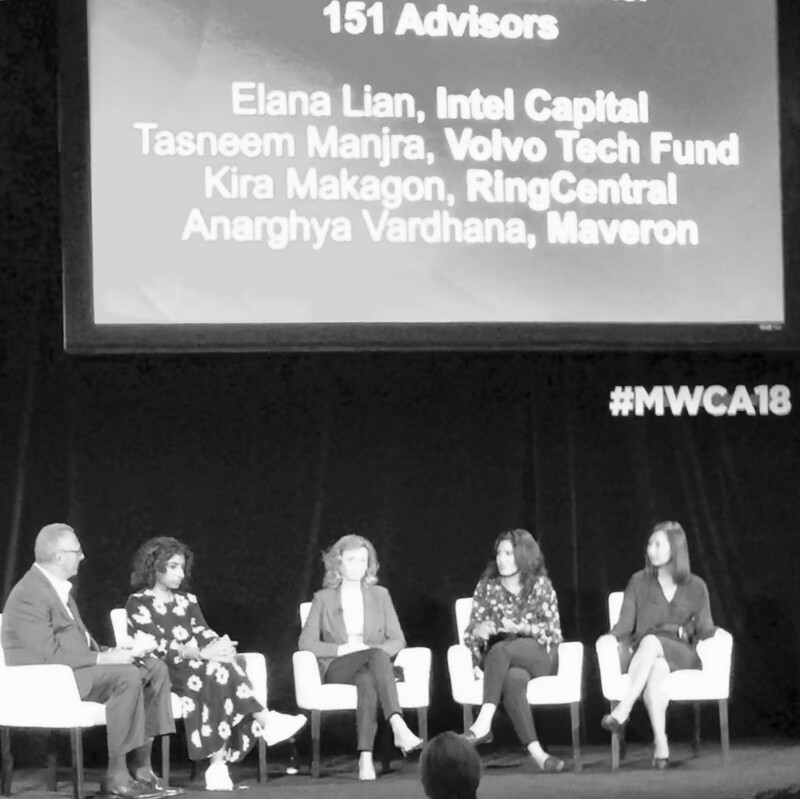 I was joined on stage by a stellar panel of professionals including Elana Lian from Intel Capital, Anarghya Vardhana from Maveron, and Kira Makagon from Ring Central; the session was expertly hosted by Steve Brumer of 151 Advisors. My participation was risky at best, my background is in marketing and communications (and just for fun, a touch of product) for Fortune 500s, start-ups, and only recently in venture. By recently, I mean a month. I decided to spare the audience relatively baseless assertions of expertise and instead share a few pointers in an area where I at a minimum, have dabbled in for more than a month: positioning. At the request of an audience member to share my presentation, I am taking a crack at this medium called Medium. Herein lies my script — I hope this is helpful. Consider this sobering fact: female founders received only 2% of all venture funding in 2017. Given that female-founded companies made up only 4.4% of all deals — that’s not entirely shocking. What is surprising is that the average deal size for a female founder led company was a little over $5 million versus $12 million for a male founder led company. There are clearly plenty of opportunities for female-founders to increase their access to VCs and when they receive funding, check amounts. Now, turn that frown upside down: VC’s are looking for great investments. They want a company with a great founding team, a meaningful value prop, and the potential for serious growth. If you have a great idea or a great company — they WANT to invest in YOU. Funding is yours for the taking. Here’s where words matter; don’t lose any at-bat opportunities because a VC is unable to understand what makes you and your company special. Position yourself for success from the time a VC views your deck or your website to the time you sign a term-sheet. Here are the top five things you need to do to ensure you’re communicating the right message to VCs. 1. Know your audience. Typically, your first meeting or interaction with a VC is with an associate. This is a hunter — they are looking at anywhere between a few dozen to a few hundred start-ups per month. You need to be able to pass their sniff-test, communicate the viability and value of your company, and avoid the “skip” pile. Ultimately you want this person to advise a partner, who has control of the purse strings, to take a good look at your company. Capitalize on this system by ensuring that within the first 30 seconds of meeting you, opening your deck, or landing on your website — an associate or their colleagues know exactly what you do. This includes the name of your business, what you have created, and why it matters. Avoid overused words and phrases like “this is the uber of”, “unicorn ” or even “disruptive.” These and their proverbial cousins can imply that you’re not creative, and even worse, not innovative. Also, consider the importance of providing a number quantifying your target market. Essentially, revenue potential equals revenue per users (times) the number of users who could possibly consume your product or service. The latter variable should be as big as possible in order to yield a number that excites a VC. One note: you may chat with a VC who urges you to consider other markets — nod yes! It never hurts to “consider” anything, what you ultimately do will be a decision you make with your managing team and board of directors at a later time. 3. Be intimately aware of the costs of doing business. First, have a breakdown of how much it cost you to get your business and/or product up and running. This includes R&D, contractor fees, and patents. Additionally, you should know exactly what it costs to keep your doors open. This includes salaries, rent, administrative services, etc. This is your effective burn rate — a VC wants to know this number since your business may take time to scale, and part of their investment may be used to fuel the burn. 4. Understand your current and future revenue model and be prepared to defend it. I’ll give you a small example for context: I used to own a small juice store in Menlo Park called Bushel Whole Blended Juices. I had a retail operation as well as a delivery business that supplied fresh blended juices to VCs, startups, and large tech companies. The first thing I did even before I sold my first cup of juice was setup a spreadsheet that would basically use a few inputs from me to spit out a calculation of profitability based on my COGS, delivery and resource requirements for any given order. I made every decision based (mostly) on this model and taught my managers to do the same. Consider building your own model so that you’re intimately clear on what revenue model and targets make the most sense for your business. Your revenue model will also give you a sense of when you will start to break a profit based on your sales projections. This will help you to determine and explain how much you want to raise and what you plan to use it for. You will most certainly be asked to provide detail on this at some point in your discussions with a VC. “Growth” is almost certainly not a good answer. Do talk about the specific elements of your business that will benefit from funding — maybe it’s hiring engineers or a sales team or ramping up manufacturing. Side note — I beg you to please refrain from uttering the words “I’m not a numbers person.” Do what you need to do to be able to discuss your financials and revenue model with a VC in a clear way, even if that includes taking an Excel or basic finance and accounting classes. You need to know enough to speak competently about your company’s financial health. 5. Finally, be confident. VCs can be painfully brutal, because let’s face it, the business of money isn’t about the warm & fuzzies. Dress for success, not theatrics. Know your business inside and out. And speak up. By all means, take feedback, but don’t be a punching bag. Ultimately you need to believe in your business. You will get rejected by VCs — maybe even hundreds of times. If you believe in your company, your vision, and your plan — dust yourself off and try again! If you are ever in the Bay Area, please drop me a line. I look forward to hearing more about your startup Now go get ’em tiger!. Tasneem has spent the greater part of 15 years developing and executing marketing plans for startups and Fortune 500s. Most recently she was head of marketing at Poynt, where she executed partner marketing with leading financial institutions worldwide, led PR and communications; simultaneously, she developed product firsts in her role as product lead for all things merchant experience and insights. A Los Angeles native, Tasneem benefitted from clean air, free health care, and poutine in Canada, where she completed her Bachelor of Science at the University of Toronto; she also holds an MBA from Pepperdine University. Tasneem is currently Head of Network Development for the Volvo Tech Fund, where she will lead marketing and strategy initiatives geared at increasing the visibility of the fund. Personally, a concerned citizen, tree-hugger, and mother. Professionally, a marketer and product person flexing my experiences at a corporate VC.